The Director General, Voice of Nigeria (VON), Mr. Osita Okechukwu on Sunday said that President Muhammadu Buhari, by his profound proclamation, has announced the results of the annulled June 12, 1993 elections and by extension ported Generals Ibrahim Babaginda and Olusegun Obasanjo into the Anti-Democratic Hall. Buhari also conferred the highest order of Grand Commander of the Federal Republic (GCFR) on MKO Abiola, the winner of the election. The DG of VON said this while answering questions from newsmen at the annual Igwa Nshi festival in his hometown, Eke, Udi Local Government Area of Enugu State. Buhari had also made a proclamation that June 12 is the new “Democracy Day” of Nigeria and not May 29 anymore. The Senate in its resolutions, commended the President for taking these bold steps, but asked the Independent National Electoral Commission (INEC) to declare the results of the June 12, 1993 elections. But Okechukwu picked holes in the call by Senate for the declaration of the result, insisting that it was needless, saying the profound proclamation is the result declaration Nigerians waited for 25 years. He emphasized that Buhari announced the results when he officially declared the June 12 election as the freest and fairest in the annals of Nigeria’s history. “Mr President spiced it with the GCFR, the highest honour in the country he conferred on MKO Abiola and Grand Commander of Order of Niger (GCON), the second highest national honour on his running mate, Ambassador Babagana Kingibe,” he said. 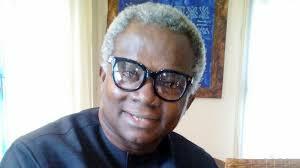 Okechukwu restated: “For me, life is about a coin. A coin has two sides. I read a letter from Kola, Abiola’s son, on behalf of MKO's family thanking Mr. President. I read statements from the PDP and the APC, congratulating Mr. President. This is democracy. We in the majority welcomed it. Minority are in the Anti-Democratic Hall.